Emergence of various lifestyle diseases has been witnessed worldwide, especially among teens and people lying in the 50-60 years age group. Lipid disorders are largely caused due to high cholesterol and triglycerides, which ultimately can result in increased chances of heart diseases, which has prompted the development of safe and efficient treatments for lipid disorders. Moreover, smoking and drinking have largely contributed to the rising prevalence of lipid disorders and other cardiovascular diseases among men and women. This has fuelled demand for advanced treatments such as introduction of modern lipid lowering drugs. The demand for lipid disorder treatments has risen owing to occupational diseases caused by higher consumption of alcohol results in rising amount of bad cholesterol or LDL, irregular eating habits, lack of body exercises and improper medication. Analysis of Transparency Market Research shows that the global market for lipid disorder treatment is expected to grow at an exceptional pace during the period of assessment. This growth is fuelled by rising demand for modern lipid metabolism disorder treatments coupled with increased chances of cardiovascular diseases across the globe. The global market for lipid disorder treatment is poised to register a value CAGR of 7.4% during the period of assessment, 2017-2026. Several biopharma companies are focusing on developing effective solutions for treating lipid disorders. 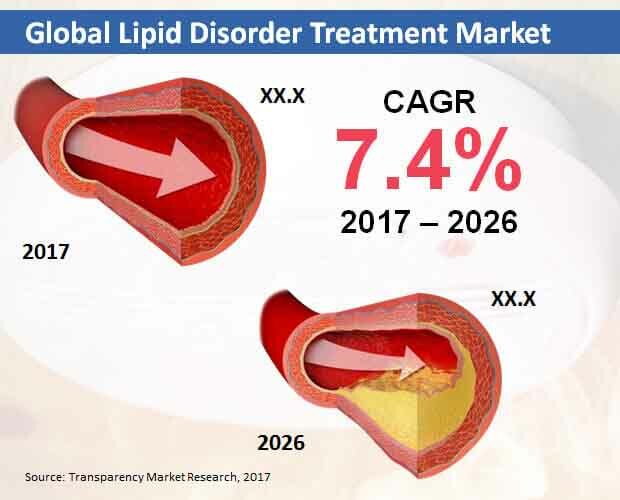 Companies involved in lipid disorder treatment market include Teva Pharmaceuticals, Mylan Pharmaceuticals, Inc., Kowa Pharmaceuticals America, Inc., Glenmark Pharmaceuticals Ltd., Sun Pharmaceuticals Industries Ltd., and Wockhardt Limited. United States has registered a higher number of people acquiring lipid disorders, especially among adults. Growing consumption of drugs such as atorvastatin and fluvastatin to treat hypercholesterolemia and other associated lipid disorders has been witnessed in the country. Several tests have been performed to identify patients who have a high risk of developing lipid disorders owing to family history or genetic disorders. According to American Academy of Pediatrics and National Heart, Lung and Blood Institute, atherosclerotic cardiovascular disease is a leading cause of death in the region. This has pushed the use of prescription drugs in the region, making it imperative for pharma companies to increase their production rate and revise their production cycles. In addition, screening for lipid disorders in childhood has been initiated in the region, and as per study, a moderate percentage of children population in the United States is being affected by lipid disorders, that typically surface as the child reaches its teenage. This has presented potential opportunities for sale of drugs for the treatment of lipid disorders in North America, making it an attractive region from a business point of view. As the risk of developing lipid disorders increases, pharmaceutical companies have initiated drug enhancement, introduction of new drugs and conducting phase trials of these drugs on a large scale. Statins are considered to be highly effective in lowering the rate cardiovascular events. Most companies are focusing on mass production of atorvastatin as they are a highly effective low density lipoprotein lowering agents, LDL being the main cause of lipid disorders and associated heart diseases. The consumption of atorvastatin is expected to grow at a higher rate. Market for atorvastatin is poised to reach a value of over US$ 16 Bn by the end of the assessment period. Extensive research report on global lipid disorders treatment market skilfully crafted by Transparency Market Research depicts the current as well as future scenario of various drugs used to treat lipid disorders. The research study includes analysis on key developments that are shaping the demand for advanced drugs for lipid disorders. A detailed qualitative assessment has been covered in this research report that delivers value by offering weighted analysis on restraints, drivers, trends and opportunities in the global market. Readers of the report can benefit from the actionable intelligence provided in this research report that is likely to impact the growth of the global market in the coming years. An in-depth market assessment on the cost structure of various drugs used in the treatment of lipid disorders, detailed supply chain analysis, analysis on sourcing of raw material and various service providers has been covered for the reader’s perusal. Such an intense market analysis can support the reader’s decision in making expansion plans, implementing key strategies as well as tapping new regional markets and developing new products. Moreover, scrutiny on various lipid disorder treatments also covers the supply and demand scenario at a global level. The reader of the report can expect a high level analysis on major market aspects impacting the consumption and sales of several lipid disorder treating drugs. Detailed market segmentation carried out on this market covers every angle offering the readers with insights associated with sluggish or lucrative growth avenues. Detailed segment wise analysis offers the readers with market intelligence that can be used to distinguish between high growing, moderate growing and slow growing regions. New revenue pockets can be identified through the analysis done in this research report. The research study analyzes each and every segment of the market across key regions in the globe to portray a complete market understanding for a forecast period of nine years. The research study also covers historical data and current market scenario. The research study on global lipid disorders treatment market includes a comprehensive competitive assessment that offers key insights on major pharmaceutical companies involved in the manufacturing of drugs for treating lipid disorders. Business strategies, market entry strategies, product portfolios of these key players has been covered in this research report. A complete market intelligence package is promised by Transparency Market Research by including the section on competitive dashboard that tracks the activities of various companies, thus assisting the reader in sating key tactics to gain competitive advantage in the years to come. Additionally, key financials, revenue shares and profit analysis across range of products is included in this section. This information can assist the readers in analyzing weaknesses, threats, opportunities and strengths in the market. The information on various segments, regions and competitors covered in this research report has been compiled using extensive secondary and in depth primary research modules. Moreover, investor and press releases, trade associations and industry databases have been churned to gather additional information thus presenting a portraying a complete market scenario. The process carried out during research ensures a high accuracy data and statistics, thus increasing the credibility of the research study. Readers can benefit from the comprehensive 360 degree market outlook that covers key insights of the global market along with future market projections. Additionally, the research report can support upcoming businesses in gaining hold in the global market by identifying revenue pockets across the globe. Moreover, the systematic report structure and skilful statistical presentations make this research report user friendly and the analysis and insights can be used to formulate business strategies.